Light to moderate snow is expected to develop over the northern Plains later tonight into Tuesday. 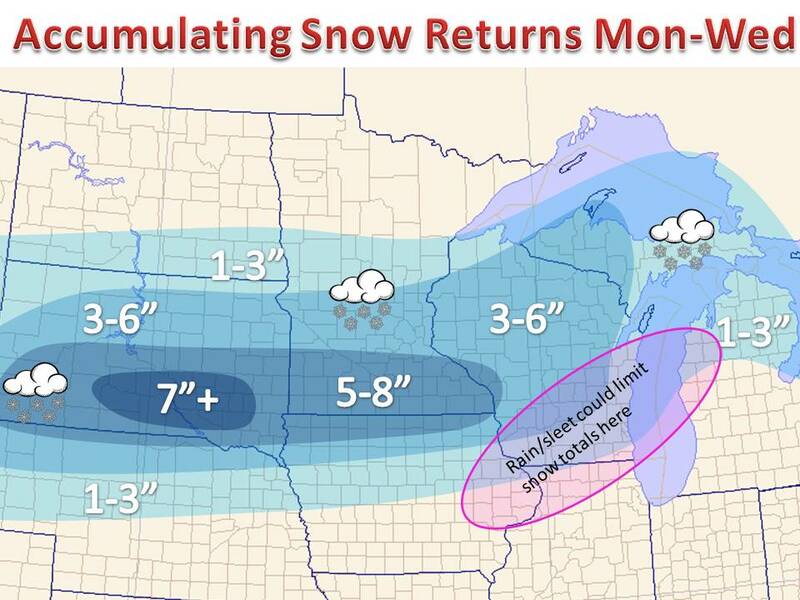 The snow will linger into Wednesday for parts of the Upper Midwest. This system will deepen tonight, then weaken as it passes to the east over the next couple days. Consequently, the heaviest snowfall will stay in western sections of the region, across South Dakota, but a solid 3-7" of snow will set up east towards Wisconsin. Total snow of 4-5" amounts will be common, but a narrow band of up to 7-8" will fall where the more persistent snow bands line up. Questions still arrive in how much rain and sleet will mix in across southeastern Wisconsin, with a lot of snow coming during the day for much of Wisconsin, snow accumulation on pavements will be somewhat limited, as grassy surfaces will pick up more snow. Below is the total snowfall you can expect over the next couple day, with slightly less on roadways for those that see more snow during the day, as temperatures will hover around freezing. Be sure to follow on Twitter and Facebook for more weather tidbits and updates.